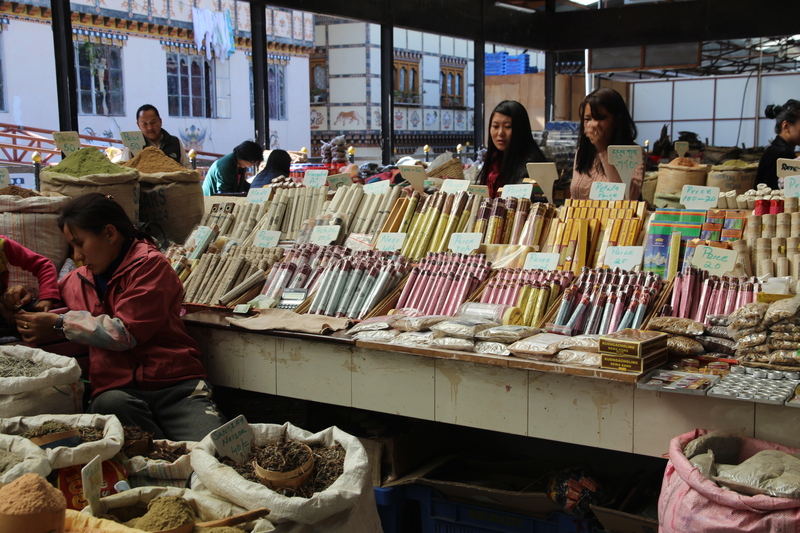 Discovering new ingredients in a Bhutanese market | Where to next? 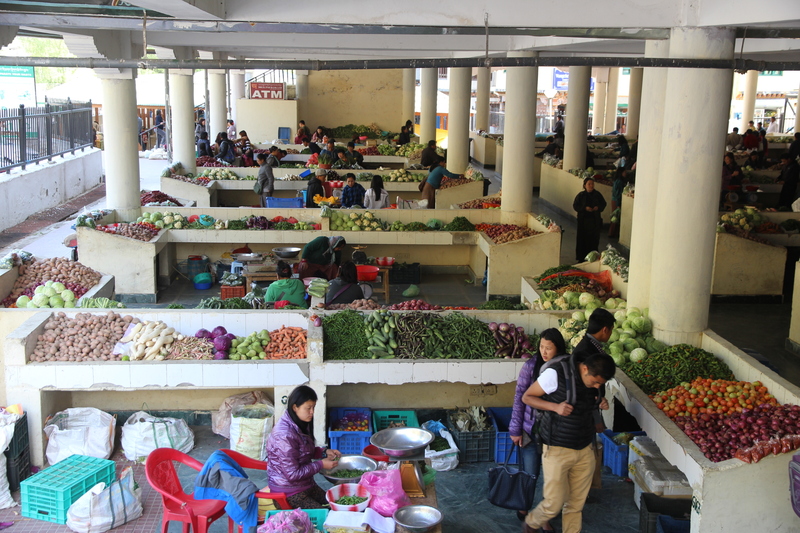 We didn’t have the chance to visit many food markets while we were in Bhutan, but the weekend farmers’ market in Thimphu (the capital) helped to tide me over until my next ‘fix’. This amazing market draws vendors from all over the country and nearby India too, I think, as there was an entire section of Indian food items. Farmers start arriving from Thursday and stay until late Sunday, unless they sell out. 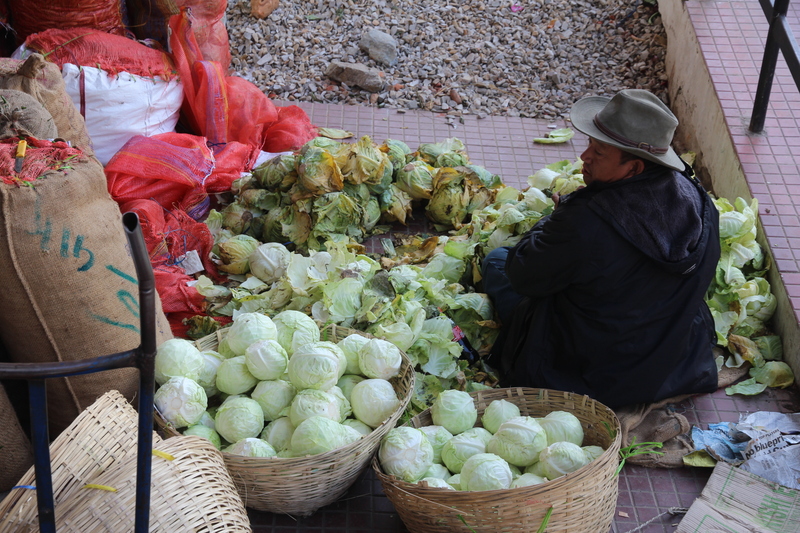 The market has two parts—food and craft— and is located on the edge of town, near the Wangchhu River. We focussed on the food section and were rewarded with new ingredients and new takes on some known ingredients. 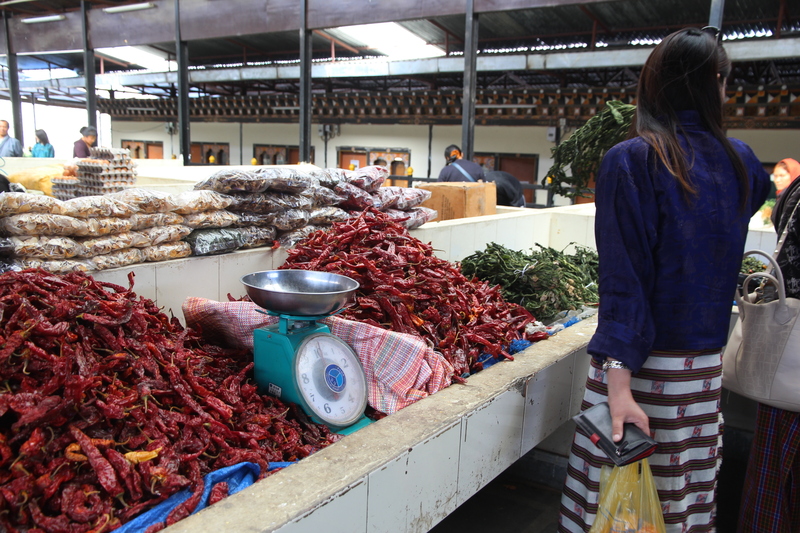 After eating just a few meals in Bhutan, we figured out that cheese and chillies are the national ingredients. They’re in virtually every dish and served at every meal—even breakfast. Not surprisingly, the market had hefty supplies of these national ingredients. Fiddlehead ferns are another popular item. I’ve known about these ferns for years and always thought of them as being native to Canada. Let me tell you, they grow wild all over Bhutan too. We had several meals featuring ferns—they are delicious—but the first time I saw them for sale fresh was in the Thimphu market. Although not a food, incense was another common item on display. It’s important in the home and in monasteries. I don’t think religious rituals can take place without dozens of incense sticks burning. A completely new-to-me ingredient were crow’s beaks. These bright green vegetable pods are hollow inside and a little bigger than a thumb. We never ate any, but they smell a bit like cucumbers and I’m told they taste a lot like green beans. Common names used in Bhutan for this plant include slippery gourd or olochoto and kichipoktho. I’ve now discovered that crow’s beaks are also grown in South America (although I never saw it there) and that, in tropical climates, the plant can grow to 40 feet. I’ve seen plenty of bitter melon in markets around the world, but Thimphu was the first place I ever saw it pre-sliced. Nice idea. I was surprised to see banana pods, tamarillos and other fruits that I think need a warmer climate to grow. But Bhutan has better weather than I imagined. In fact, the southern part of the country, that borders India, is quite mild for a good part of the year. The market was well-supplied with all sorts of produce that is designed to keep well. This especially makes sense in a place where remote and rural households might not have refrigerators or reliable sources of power. 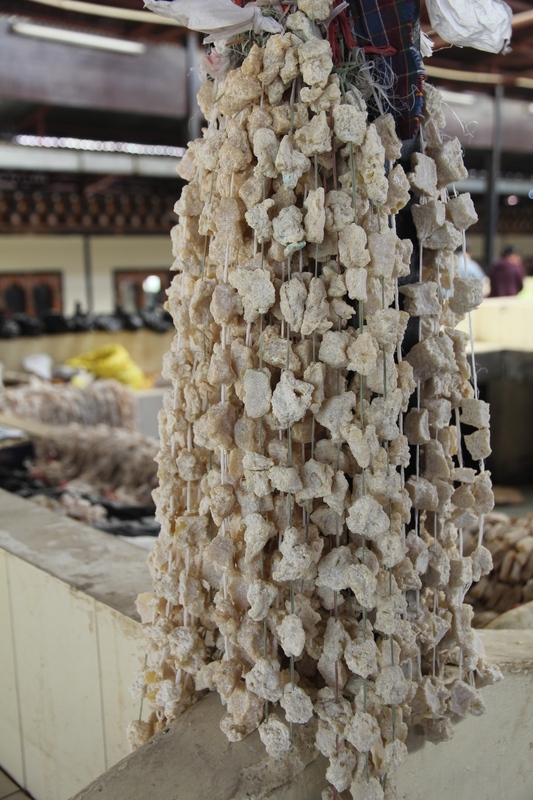 So there were vast arrays of honeys, pulses, dried vegetables, dried mushrooms, dried fish, tea, pickles, and herbs and spices. They were selling the biggest bay leaves I’ve ever seen. Of course, one of the best things about visiting markets is the people-watching. It’s a chance to see how and what people buy and sell, what they wear and how they work. Dried cheese …….wow ! Never seen that one before. Nice shots ! I hadn’t seen cheese like that before either. Your images are gorgeous! What an amazing experience! Thanks so much. It was a wonderful market to visit. Fascinating – I had no idea that ferns of any kind were edible. And the hanging cheese looks like installation art! Funny you should say that. Neighbours two houses down have an art installation that looks much the same. Fascinating market. The idea of a market that is there on Thursday, gone by Monday is so alluring. No sliced bread there, I imagine! No sliced bread, in fact, not much bread at all in Bhutan. Our Fyshwick Market in Canberra is open Thursday to Sunday. I can buy great bargains after 4pm on Sunday. I think you’re right, Curt. Not only do the cheeses have to make it to the market, but they have to survive for the buyer too. It is. We camped all the away across Bhutan and needed to carry food that would keep. I can’t imagine living without a fridge. In fact, I have two and both are crammed full. 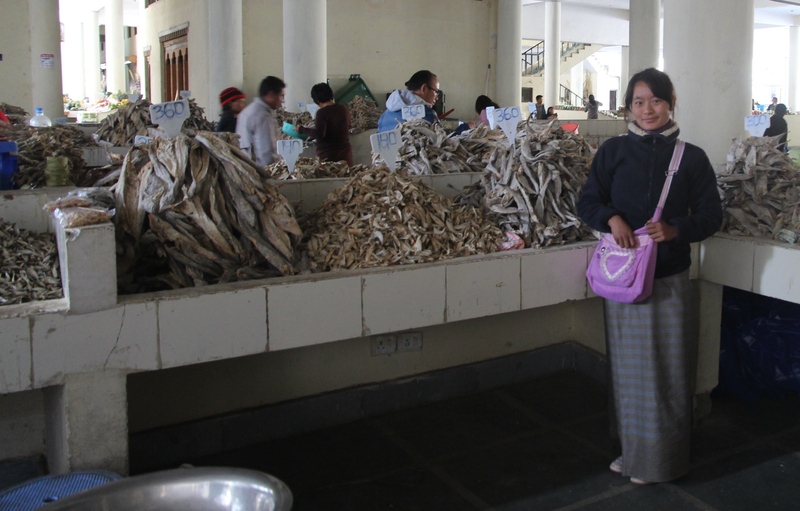 Thank you LeggyPeggy, for another great post of a food market in the capital of Bhutan. Each food area is simple, but clean and the people seem to be dressed nicely. And yes, many vegetables, cheeses which are new to me. How is the cheese used, served? What is that red closed tulip/flower vegetable? and with beige thin tubes? around it? Also, I am surprised there is no fresh milk/yogurt from local domesticated animals, water buffalo, goats…or fresh meat (even without refrigeration) or dried. Where did the pineapples come from? warm India? Oh yikes, I forgot to mention butter and livestock. All the milk (from cows and yaks) is made into cheese, butter or some yogurt. Bhutanese are big meat eaters, but they don’t slaughter any of the livestock themselves. That gets done in India. The red closed flower is a banana pod—or flower of the banana tree. It’s edible, but I don’t think I’ve ever had it. Cheese goes in everything. Usually it melted into a dish. Can say I had any ‘raw’. I love food and markets too! Canberra has a couple of farmers’ type markets and I should do a blog post on one of them someday. As for the ferns, all of what you see is edible—heads and stems. I think all the ones I had were steamed with butter and some seasonings. Love the photos. Love markets – here and overseas. Might be related to my love of shopping. Thanks so much for dropping by. Always appreciated. Beautiful, colorful photos. I have found that visiting a market in a new country is a good way to see the locals in their element. Yes, markets give a wonderful insight to a culture. Wow that looks like fun! Beautiful photos, wish I was there! It was great. Thanks for stopping by. Fantastic blog. Bhutan is a place I have always been wanting to visit. Thank you. We had 15 days there and I have lots more to post about. Just getting all the photos and words organised. Hi, I am planning for Bhutan. Can you tell me if you took flight from Calcutta or From Baghdogra airport or directly from Delhi? We entered by road. We travelled India with Prayaan India Overland and they also took us to and through Bhutan. All our travel there was by road. Happy to pass on as much information as you’d like. There are some interesting food items at the market specially the hanging cheese. Have also not heard of many of the other vegetables. I hadn’t heard of some of them either. Thanks. We really enjoyed it. Thanks. I can always use a smile. I LOVE your photos and descriptions — both equally colorful — of this market!!! I would love to know how to prepare banana pods… Did you get to try that there? Thanks so much. I had banana pods in Africa and Papua New Guinea. I can no longer remember how they were prepared—just that I had them. But I can buy them in Australia. Time to look for a recipe. Well they have them at Berkeley Bowl so looks like this might have to be my next recipe challenge for my blog! Omg I’ve totally enjoyed the pictures; dried cheese, giant bay leaves, lots of herbs and spices. That is what I call a market. Thanks for sharing! My pleasure. It really was an amazing market. I am born and brought up in Kolkata (India),which is not far from Bhutan.Surprisingly I never have seen ‘ Fiddlehead ferns’ and ‘dried cheese’. This article is extremely informative. By the way banana pods are my favorite vegetable,my Mum used to cook banana pods with prawns.Thank you for sharing your wonderful experiences. I am looking forward to visit Bhutan. 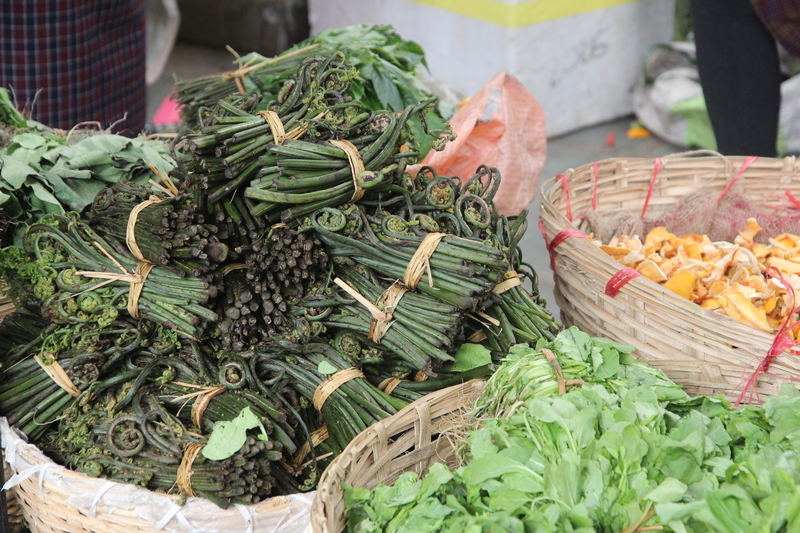 I knew of fiddlehead ferns and dried cheese, but I have never seen them until I got to Bhutan. I’ve never cooked with banana pods. Maybe I can soon. I hope you get to visit Bhutan. It is fascinating.